The Fab Chick: Trend Alert: Lace-Up Boots for Fall 2010These aren't my granny's laces!! The Romper Makes Its DebutI Wore It!!! Wear What FitsGet rid of what doesn't! DLUX Online Launch EventShopDlux.com Now Open! Butter LONDON Manicure w/ TJ! Honored to have been named one of Forty Fab Fashion Bloggers on Essence.com. See here. 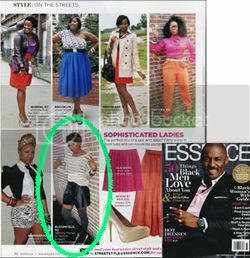 I was featured in Essence's November 2011 Issue on page 36. These aren't my granny's laces!! I am in love with lace-up boots for fall. The style lends itself to the popular military and utilitarian trend that’s on my Fall 2010 favorite trends list. Check it out here if you’ve missed it. Last fall I stocked my closet with a few pairs of the new millennium granny boot style in a variety of lengths. Needless to say I wore them to death! For fall 2010 the love affair is still going strong. I definitely will be rekindling the flame and bringing out all my lace-up boots to stomp the NYC pavement in as I venture out and about. I’m sure you’ll be catching me laced up. Since my closet has a couple pairs already, does this mean I can’t purchase a few new pairs that I’m in love with? all that I can say is HOTTTTT!! I love most of them, le sigh, I need to shop! Love this trend as well. I have a few pairs of lace-up boots myself, but I definitely need a pair that has more of a military feel. I really cannot wait for Fall.